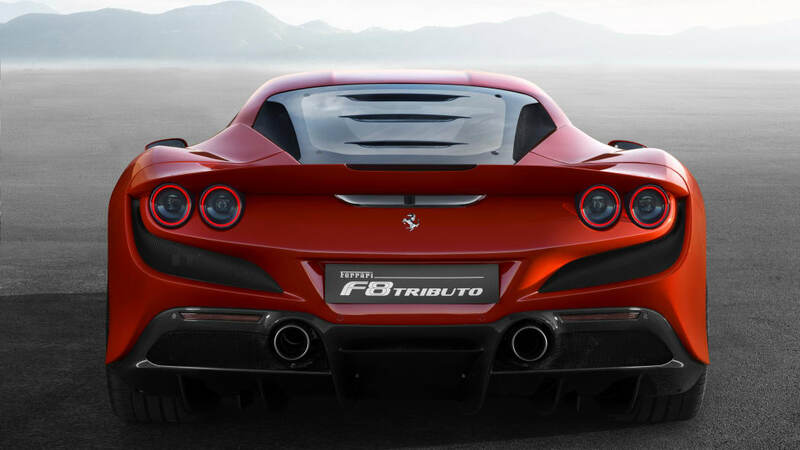 This is the Ferrari deemed worthy of replacing the 488 GTB, called the F8 Tributo. Let's start with the red meat: 3.9-liter twin-turbo V8 producing 710 horsepower and 568 pound-feet of torque. Those numbers sound familiar? They're the same as we got from the special edition 488 Pista, and they outdo the 488 GTB by 49 hp and seven pound-feet. The F8 Tributo warps itself to 62 miles per hour in a Pista-matching 2.9 seconds, takes two tenths longer to reach 124 mph at 7.8 seconds, but runs all the way to the same 211-mph top speed. What's more, the F8 Tributo weighs 2,932 pounds dry when graced with all of the lightweight options. That's 111 pounds more than the Pista, but an 88-pound diet compared to the 488 GTB. Rear-slanted radiators frame an evolution of the Pista's S-Duct to redefine the front end. 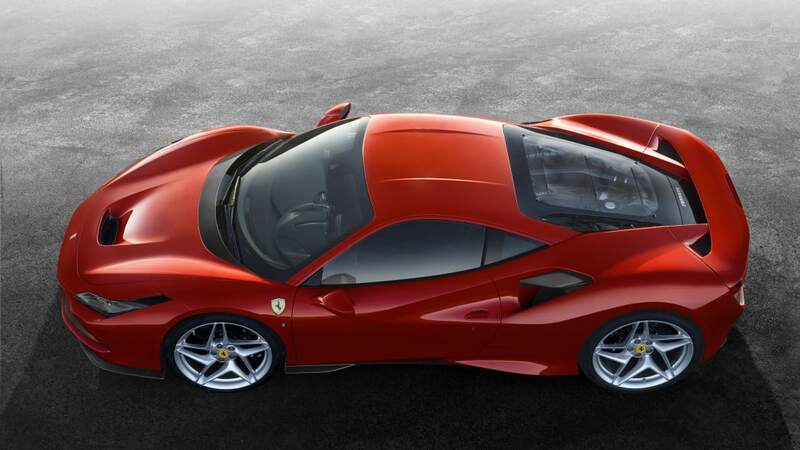 Ferrari said the under-over airflow trick delivers a 15-percent increase in downforce compared to the retiring 488. Redesigned headlights take a horizontal stance, making room for brake cooling ducts that obviated needing to fit larger brakes. The Lexan engine cover and its three subtle louvers hearken to the F40, and the quad taillights hearken to Gran Turismo Berlinetta Ferraris of yore. 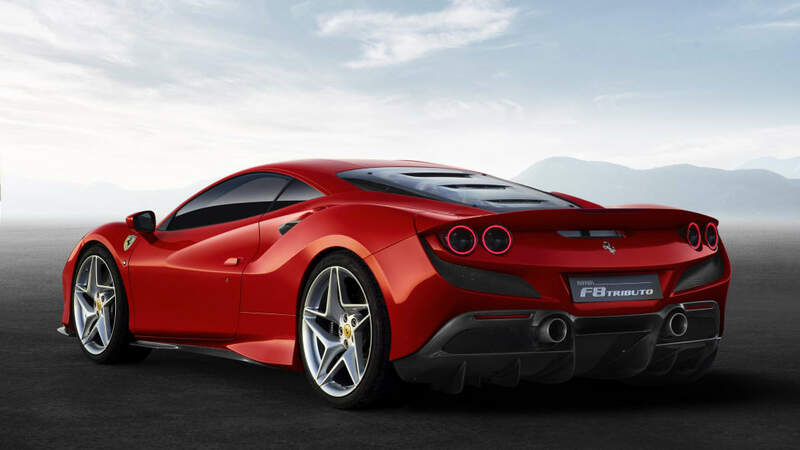 The enlarged spoiler hunkers over that light cluster in 812 Superfast fashion, above a rear fascia that incorporates curved mesh grilles. 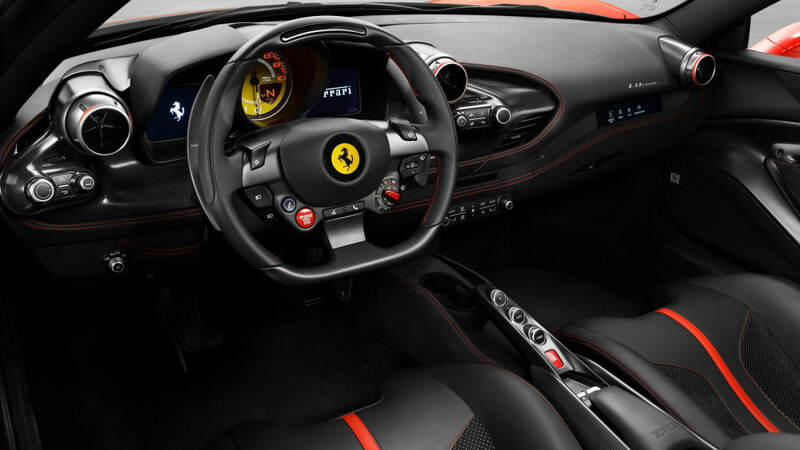 Ferrari says the overall look is "the bridge to a new design language." 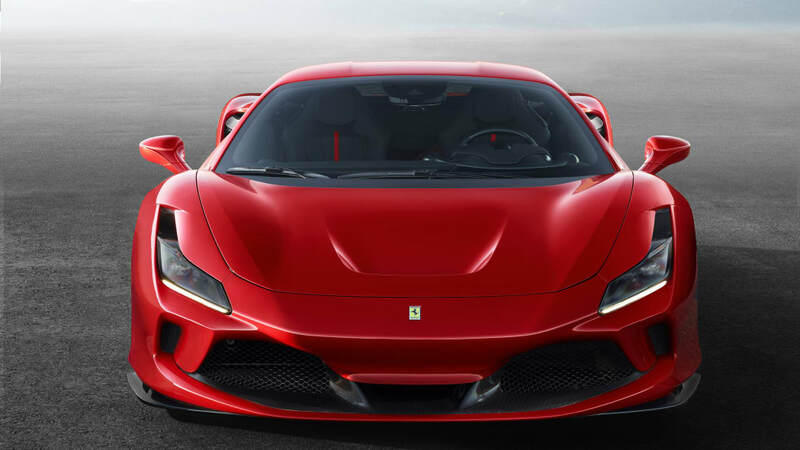 As a side benefit, it confers a 10 percent improvement in aero efficiency compared to the 488. 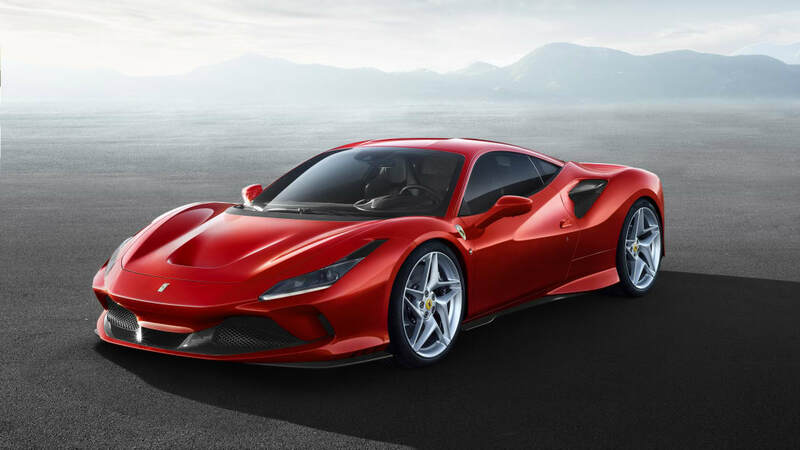 Ferrari's updated its Side Slip Angle Control (SSAC), and made the revised Ferrari Dynamic Enhancer (FDE) available in Race mode "to make performance on limit easier to reach and control for greater number of drivers." SSAC allows for more drifty attitudes, the FDE adds automatic braking inputs to reduce the need for sudden countersteering. Formerly, FDE was only available with the steering wheel manettino control in the CT Off position. The cabin's been overhauled, starting with a smaller steering wheel dotted with a couple of additional buttons for hands-free phone operation. The former oblong vents give way to round ones, there's a new digital interface for the driver and 8.25-inch touchscreen for the passenger, and new door cards. We will be taking a much closer look at all of it come Geneva. [4k] 720 HP Ferrari F8 Tributo a McLaren 720S CRUSHER? look as if they sprung from some comic-book illustrator's fever dream. Very exciting design still and technical advances march on as one would expect nothing less from the leader! I'm glad it's more of a refinement of the Pista than the original 488 which I did not much care for. Judging by its name, it also seems that the rumours of a hybrid V6 may be true and this may be the last V8 mid-engined production car. Rumors are still for a new (relatively downmarket) Dino V6 which should have a different body? Surprised in this era of F1 V6 turbomotors that linkage to Dino name (as in the '50's) hasn't been used in F1? I could be wrong, but I'm sceptical of the Dino rumours. F8 tribute seems a strange name to give the car., even by Ferrari standards. The Portofino was launched only last year and with the persistent rumours of a new SUV, I don't think Ferrari can or should maintain so many different production models. We'll see. I'll definitely be buying an F8 Tributo... as a scale model of course.